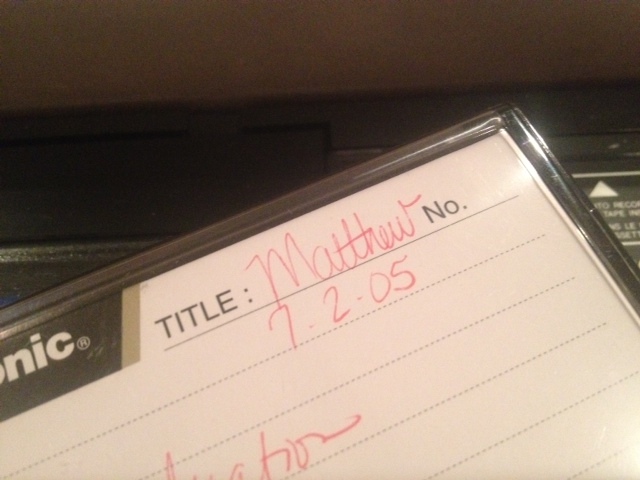 After eight plus years, I had the courage to watch the video of Matthew’s birth and death. I have not been the same since. The video recording began when all was well and happy with us expecting to deliver Matthew when I was in labor. It did not end the way it was supposed to. At all. It was pretty early in the morning after the kids went to school and my husband went to work when I felt the urge to pull the video cassette out of safe keeping to watch. I thought I shouldn’t do this but kept on walking toward the television. I hesitated for about three seconds before I put the 8 millimeter cassette in and hit play. It didn’t work at first so I had to try it again. I thought perhaps I shouldn’t watch it, but knew it was the right time for me to see it. What I remember of the day that Matthew was born and the day he died were all fragments, bits and pieces of broken and missing parts here and there, but all leading to the end result, his death. I sat with my hands over my mouth, about three inches from the television set, my heart pounding out of my chest, as I watched the agony on my face, the pain in my eyes and heard Matthew’s heartbeat for what would be the last time, for well over forty five minutes as I labored hard and delivered my precious son. I remember the bad, the really bad. But the truth is, with the trauma of it all, I didn’t remember any beautiful moments as I delivered Matthew. I was in and out of consciousness and didn’t even realize these huge chunks of memories would be dissolved somewhere in it all. This video connected the dots, the forgotten moments of birthing my son. The process of his birth, every push, every contraction, every held breath while everyone was gathered around me expecting to see a beautiful baby boy alive and well at the end of the laboring. My mom fanning my face with a piece of paper, my husband holding my hand and my sisters waiting in the “no camera zone” to see if Matthew had hair, my mother-n-law calling family and telling them it was “time!” This is all captured, these beautiful, forgotten moments. Of course, there were other terrible moments along the way that I had not remembered either. Terrible ones. I got pretty numb really quick when the video began. I have never watched anything so attentively as I was watching this. I was so afraid of what I would see. I knew what was coming. I saw the clock a few times in the background when I was pushing and as it approached 9:42, my heart grew sick and sicker. But I couldn’t stop watching it. I was watching my baby die within me…every push, every contraction, his blood was spewing out of his body and we didn’t know it. He was bleeding to death and my labor was slowly killing him. I wanted to scream at the television somebody help him!!! Please help him! I wanted the time to stop! I wanted it all to be different! With every contraction, I found myself holding my breath on the other side of the screen as well. I hurt for my son that was dying. I hurt because I couldn’t protect him. I hurt so much. The place this video took me has far exerted any place I have ever been since losing Matthew. I felt wounded all over again. Watching Matthew literally die on a forty-five minute film changed me, again. I had forgotten the tender care I had in my voice when I asked if he was okay, the love and concern I had as my body worked hard to bring my baby safely into the world, this beauty was ripped from me. I would be lying if I told you I didn’t want that back. I needed to be reminded there were beautiful moments. I needed to remember it all. Not just the bad. I will admit that watching this video has stripped me down to a new and bare place. A place I have never been before. A place I was afraid of once or twice, (or a zillion times), but a place I am now ready to visit. A place that I will find the beauty in. Somehow. I know I haven’t been the same since I have watched this video but that’s okay, I don’t think I am supposed to be. It was the right time for me to watch this, and I knew it would impact me, I just wasn’t sure how. I am still not sure how, but it has. And even as wounded as I feel, I also feel like I have a new set of wings, but wings I have no idea how to use, yet. This is new place for me, it is fresh and it has me in the most raw of places, but places I need to explore. And I will. I have been quiet on my blog and with my writing. Words just don’t seem adequate enough to share how my heart feels right now. I am sad. So very sad. So very sad that there were no smiles out of something so very beautiful, his birth. So very sad that his death took that all away. But that is why I have come to this place, to seek the beauty and to capture it. So I sign off in a much different place than I was before I watched this painful video. I sign off so sad yet not regretting having watched this video at all. It is and was a part of Matthew’s birth and my experience and I am so very grateful I have it, but my heart needs a moment or three to process this new chapter of life after watching my son die on film. My heart longs to find the beauty in this film and to capture that within the very essence of my soul. And I will. I will capture that beauty for Matthew and for myself. We both deserve it. For now, I tenderly hold my mama heart in a place of protection and shelter while it bleeds a while. I’m going to let Jesus hold me while heaven holds him. I’ll be there, right there for as long as I need to…until I know what to do with my new wings…I’ll be there.